The Antelco eZyvalve4 is a compact valve box with 4 internal solenoid valves that connects to a 24Vac controller. Installation is uncomplicated and the eZyvalve4 provides a trouble free way to distribute water in a micro irrigation system. 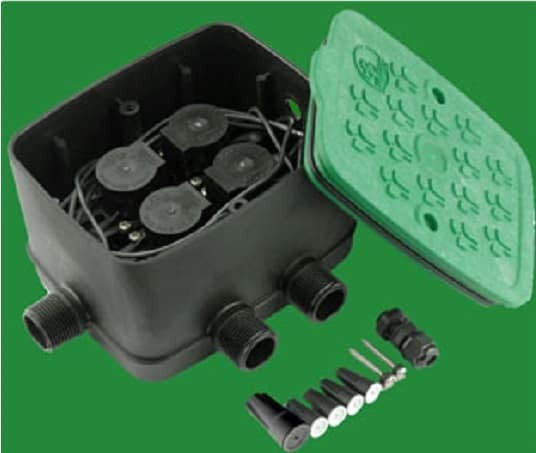 The eZyvalve4 valve box from Antelco, simplifies the connection of a garden, patio or greenhouse microirrigation system to a 24VAC automatic controller. eZyvalve4 contains four solenoid valves moulded into the base of the box. It is made of high impact, UV stabilised materials and has a non-slip lid with o-ring seal and stainless steel screws. All this makes it a water and dust resistant product that keeps out spiders, garden insects and reptile nasties! And without any internal water connections, there is no possibility of a leak inside the box. The resultant assembly also eliminates the laborious and fiddly tasks associated with connecting, taping and screwing solenoid valves in a conventional in-ground valve box. Connection into the water supply is also uncomplicated. eZyvalve4 is compatible with ¾” and 1” garden taps, either directly via the ¾” male threaded inlet, or by screwing a 1” BSPF x ¾” BSPM increasing bush onto the existing inlet. You should use a high pressure rated braided hose for this connection because the tap will most likely remain live. The box can also be directly plumbed into an irrigation mainline and installed below ground if you so desire. 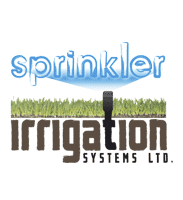 Although eZyvalve4 is particularly suited to controlling commonly used micro irrigation emitters such as drippers, microjets and sprayers, it can also be used to control water to pop-up lawn sprinklers or to low output sprinklers used for general garden bed watering. Thus eZyvalve®4 provides a trouble free way to distribute water in a garden micro irrigation system. The eZyvalve®4 is supplied with an Installation Guide which describes what you get and how to make the water and wiring connections. You will also find videos describing how eZyvalve®4 can be used and the procedure for connecting the wiring. 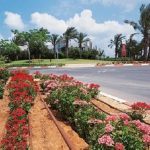 Landscape areas, home gardens, greenhouses and nurseries for above or below ground installation. Just connect water to the eZyvalve4 and run Irrigation cable ( 5 core Minimum) back to your irrigation Controller.